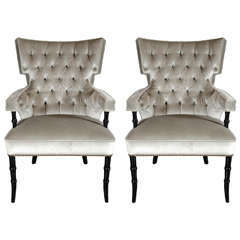 A chic and useful pair of pull up chairs in original upholstery and finish ready to be customized by you, or used as is. 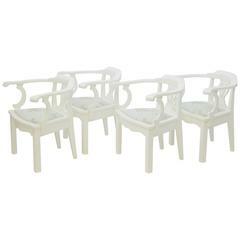 Very much in the style of designers like Billy Haines these chairs have style to spare. Original finish in Fine condition. 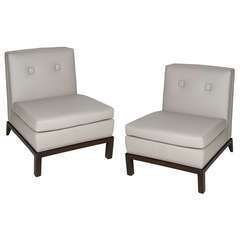 You may chose to use these as is or reupholster to suit your needs. Pair of biscuit-tufted slipper chairs covered in teal mohair, 1940s. 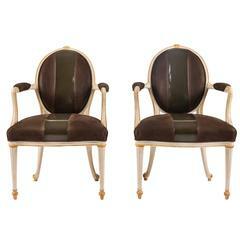 Pair of armchairs, Edward Wormley for Dunbar, model 830. Metal tag Dunbar Berne Indiana. 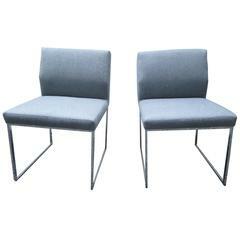 Handsome pair of zag side/pull-up chairs by Stanley Jay Friedman for Brueton. Newly upholstered in a grey cashmere/wool, clean chrome base.